After years of development and experience Dr. John Robinson and Dr. Cristina Bosch wrote ThyroZone to offer a medical solution to patients who are simply not being provided the answers they need and deserve about their thyroid and metabolism. The science based ThyroZone system surpasses the typical advice and provides unique, practical instruction that offers real results. If you or a loved one have ever experienced a thyroid condition but have always been told the test results are “normal” then this book is for you. ThyroZone offers a revolutionary approach to thyroid disease, a disease that afflicts millions of people who are often left with no real solutionto alleviate their pain and suffering. The truth is that the medical community has yet to understand the causes — or even the symptoms — of thyroid disease. This means patients have no strategy to address their disease or ways to optimize their health to provide any meaningful quality of living. Drs. 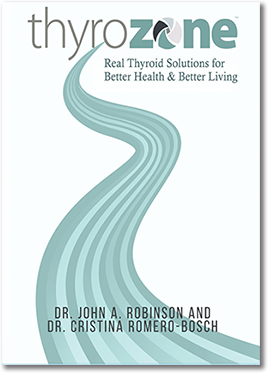 Robinson &Romero-Bosch address the solutions in their book ThyroZone.They bring their passion for healthy living and graceful aging to their patients every day at the Hormone Zone. This is the medical condition associated with a slow metabolic rate due to inactivity of the thyroid gland. It is very common condition, particularly in women and even more common in women with perimenopause or menopause. But men suffer from this condition also. Do you have symptoms of low thyroid? This is the medical condition associated with a very fast metabolic rate due to an over-active thyroid gland. This condition is less common but more acutely serious. This condition is more common in people who have a history of smoking. Do you have symptoms of high thyroid? Autoimmune conditions imply that the immune system is self (auto) attacking the body in various places, such as thyroid tissue. The triggers for this are numerous and include environmental toxins, insulting diet factors, lack of certain nutrients, emotional and physical stress, and other hormonal imbalances. This is the condition where the immune system attacks the thyroid leading to destruction of thyroid tissue and resultant hypothyroidism (low thyroid). This is the condition where the immune system attacks the thyroid leading to dysfunction of thyroid tissue and resultant hyperthyroidism (high thyroid). Reflex speed is one of the physical tests used to determine metabolic rate and therefore thyroid function. This type of assessment has been used by physicians for decades. The ThyroFlex™ machine provides an instant measurement of your reflexes and helps to determine the need for thyroid hormone balance and optimization. Listen to Dr. Robinson explain the effectiveness of the ThyroFlex™ and how it is used at The Hormone Zone. Historically, thyroid disease was diagnosed using a resting metabolic assessment, or RMR. Specifically, this is known as indirect calorimetry. For decades, physicians utilized this type of test to measure metabolic rate and therefore thyroid hormone function, but it went out of popularity when laboratory blood analysis started to dominate the medical landscape and specifically thyroid treatment. The ThyroZone™ system makes this technical machine available to patients for accurate diagnosis and monitoring, beyond the simplistic and singular view of blood analysis. One of the largest problems in the medical world of thyroidology is the poor interpretation of thyroid hormone blood analysis labs. Either not enough labs are drawn or when they are drawn, they are poorly interpreted, leaving patients usually under-diagnosed and under-treated. The ThyroZone™ system directly answers this problem with not only additional labs that are usually not considered, but a unique medical interpretation of the values using a comprehensive view and optimization goal. The ThyroZone™ system is dedicated to utilizing the most effective form of thyroid hormone for the individual patient. This is usually the prescription medication known as Natural Desiccated Thyroid Hormone (NDT). Common forms of this prescription are Nature Throid (r) and Armour (r) thyroid. The key to optimal thyroid hormone choice is a medication that contains the active thyroid hormone, T3. NDT contains this vitally important hormone. Prescriptions such as Synthroid (r), Levoxyl (r), and levothyroxine are T4 only therapy and do not contain the all-important T3, and patients normally suffer as a result. But again, the ThyroZone™ system is not beholden to any one type of thyroid hormone; only the one that best works for the patient in truly relieving symptoms and optimizing performance and safety. The ThyroZone™ system is committed to improving the nutritional health of a patient’s thyroid gland. Thyroid hormone alone is not sufficient to bring the best possible clinical outcomes. With this understanding, you will be guided towards the best nutrients for your thyroid gland and also to optimize any thyroid hormone you may be prescribed. Thyroid hormone and proper thyroid nutrition works synergistically. There are many nutrients important for your thyroid gland health, and the ThyroZone™ system will evaluate and consider as many as possible. Two of the most important nutrients for your thyroid are IODINE AND SELENIUM. Watch this brief video of Dr. Robinson explaining these two important thyroid nutrients. The goal at The Hormone Zone is Patient Optimization. The ThyroZone™ system is no different. Your metabolic rate will be continually assessed, along with your subjective and objective clinical findings, with the ultimate goal of providing the best possible thyroid hormone dose and thyroid gland health. The goal is your reliefand performance, not simply what a lab value states. The ThyroZone™ system focuses on addressing all of the potential underlying causes of your thyroid condition. But one of the most common causes of thyroid disease is autoimmune reactions that lead to Hashimoto’s (low or hypothyroid) or Grave’s Disease (high or hyperthyroid). An “autoimmune” reaction refers to the phenomena where your own immune system attacks your body, in this case the thyroid gland. Removing as many of the typical causative factors to this autoimmune reaction is the key to improvement. There are also nutritional and herbal approaches to helping with this process. Additionally, one of the most cutting-edge tools the ThyroZone™ system uses is Low Dose Naltrexone (LDN), a prescription medication with virtually no down side. This is one of the most effective tools at directly addressing the autoimmune reaction in your body and has been used since the 1980’s to combat a variety of autoimmune reactions. Your thyroid gland does not operate in a vacuum, away from the influences of your other hormones. The Hormone Zone strategy is to view your entire body in the context of a global comprehensive view of all your hormone systems. And the ThyroZone™ system considers this also. When your other hormones are optimized, then your thyroid is optimized.